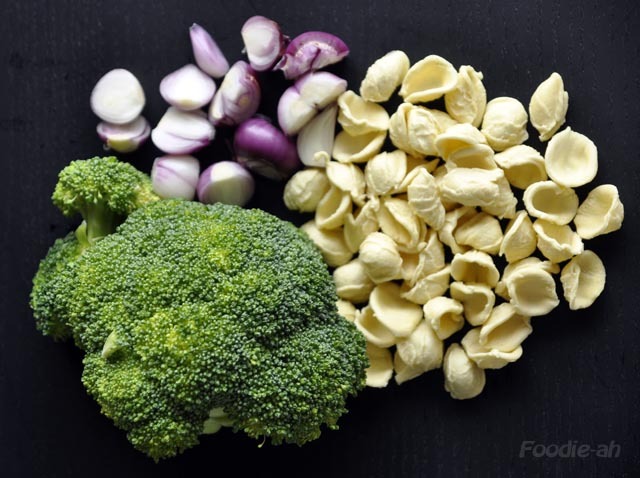 Orecchiette is a typical pasta from Puglia, a region in the south of Italy, and it literally means "small ears". This type of pasta has a very firm bite and rough texture. In a large saucepan (I never use non-stick, so use a plain metal pan), pour a generous amount of olive oil, bring it up to the heat, and add the sausage cut into chunks. Fry it until well cooked, then remove it from the pan. with the pan back on the heat, pour enough white wine to deglaze the traces of sausage and vigorously detach them from the bottom of the pan. Add the chopped shallots and fry them until golden, then add the broccoli, fry them for a couple of minutes in the hot oil then pour the chicken stock, salt and cover. Once the stock is bubbling, remove the lid and keep cooking and stirring until the stock is reduced to a third. Remove from the fire and set aside. 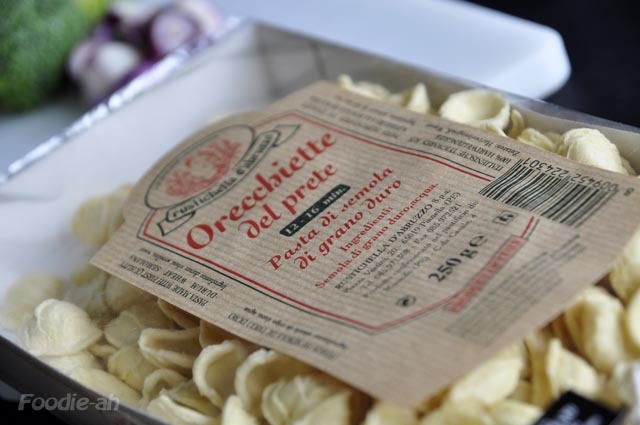 Bring some water to the boil in a saucepan, salt it and add the orecchiette. While these will be boiling, separate about 60% of the cooked broccoli and put them into a blender together with the juice at the bottom of the pan and some grated Parmesan. Blend for about 30 seconds, just enough to make a nice and thick broccoli sauce. put the sausage back in the pan with the remaining broccoli and reheat just a minute before the pasta is ready. 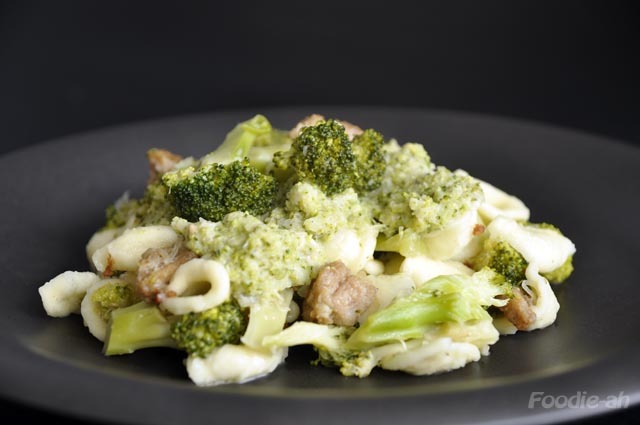 When cooked, drain the orecchiette, sautee' them with the broccoli and sausage for 20 seconds, then serve on a plate topped with the blended sauce.